New! 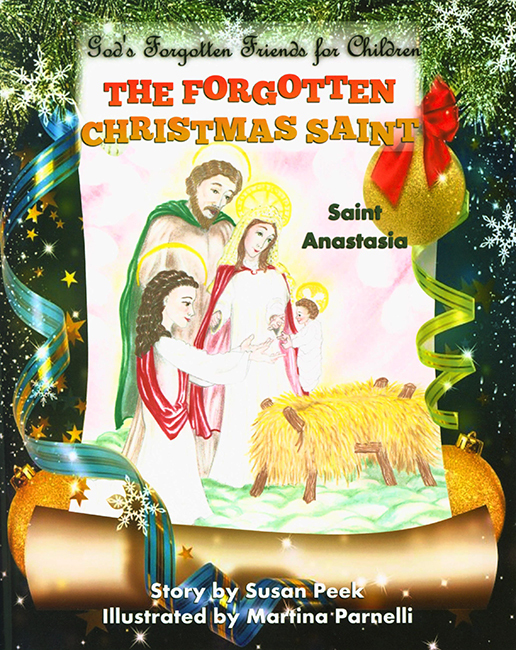 The Forgotten Christmas Saint - Meet Saint Anastasia, one of the greatest Christmas saints and the Patroness of Martyrs. Take her hand and let her lead you to the Crib! When people think of saints that remind them of Christmas, Saint Anastasia is almost always forgotten. For centuries, this humble and unassuming martyr has remained hidden in the shadows of the stable. Yet of all the saints in Heaven, she is the only one whose feast day falls on Christmas itself! It's about time she stepped forward and made some new friends! Join Saint Anastasia and her best friend, Saint Theodota, as they bravely prove their love for God and neighbor, even unto the sacrifice of their own lives. With charming full-color illustrations and easy-to-read text, this third book in Susan Peek's new series for children is sure not only to capture the hearts of Catholic children everywhere, but to inspire and inflame them with a greater love for their Holy Faith and the saints who lived and died for it. 8 x 10 inches. Soft Cover. 40 pages.